Most visitors enjoy Mount Bromo tour from Probolinggo City route through Surabaya Airport or Malang then take the route toward Ngadisari village because They have known that along the route before reach the hotel around Cemoro Lawang, there is the most dangerous route toward Mt Bromo Cemoro Lawang, the road condition is very steep and winding full of sharp curve. This path condition known as the most dangerous in Mt Bromo. It almost similar with Semeru hiking route for climbers who will do Semeru hiking package to Mahameru peak. Since the last two years the road has repaired and asphalting. Mainly through Ngadas, Jemplang and Ranu Pani. The transportation Improvement not only to facilitate the tourist visit toward Bromo national park but also expedite the marketing of agricultural products from Bromo Tengger Tribe region in four areas of Pasuruan, Probolinggo, Lumajang, and Malang. The Ngadas - Jemplang - Ranu Pani line known as the most dangerous route toward Mt Bromo. Although it is pretty smooth with hotmix asphalt, but not meant without a dangerous challenge. On the Bantengan lane, a little neglect will bring us fall down freely as much as approximately 100 - 200m to the adasan area in the southeast caldera. The width of this road only three and half meters and a half meters is shoulder's road. 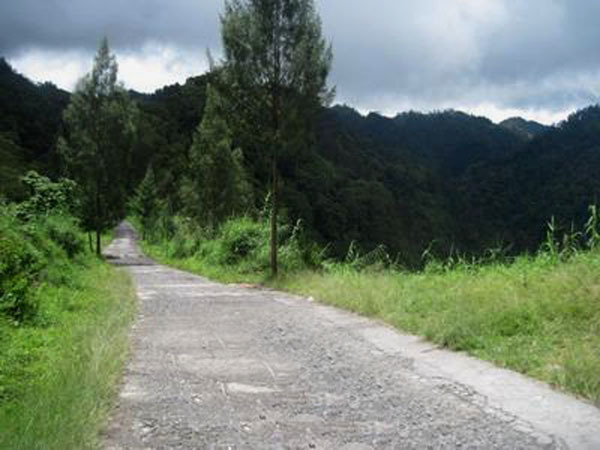 The path along theroute is still dangerous and the path of death is in Coban Pelangi - Ngadas. Hardening of the road that is between 3 - 4m wide here still with the cement foundry which will become slippery during the rainy season. The slippery lines is caused by the thin moss growing on the streets that lack of sunlight and the soft sand-washed water due to the erosion of the cliffs on the left and right of the road. The climb to Ngadas or derivatives from Ngadas with a slope of 30 ° - 45 ° ,a bend in the road up to 345 ° is an interesting challenge. a carelessness, and impatience or lack of caution will result in fatal accidents. Moreover, there is no electricity lighting at all. Although the access toward Mt Bromo Peak through Malang, Ranu Pane, Ngadas and Jemplang is very steep, You will feel very satisfied after reach the high peak like Pananjakan, Kingkong Peak and Seruni Peak because on this area all views will seem clearly especially when the weather is good, You will able enjoy Mount Bromo tour package, Mt Batok and massive Sea of Sand. Some visitors usually prefer like to stay longer at Mt Bromo peak due to the landscape really amazing for Mount Bromo Milky Way tour, Sunset Photography tour, Filming, Prewedding Photography at Mount Bromo, and other trip arrangement. From these peak, also seem the highest volcano summit normally climb by visitors namely Semeru volcano, If You are interested enjoy Semeru volcano hiking package, You can choose on April - November. Mt Bromo is the most visited volcano in Indonesia, From all the world have visited this mountain with verious vacation major especially for Photographers who prefer like enjoy Milky Way tour at Mount Bromo, Sunrise and Sunset. This volcano also become as the best place for Camping. Some photographers normally enjoy Mount Bromo trip by Camping to creat the Milky Way picture perfectly.